We’d love your help. 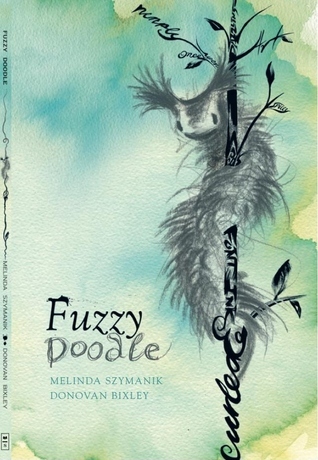 Let us know what’s wrong with this preview of Fuzzy Doodle by Melinda Szymanik. A White Ravens Selection 2017. To ask other readers questions about Fuzzy Doodle, please sign up. I read this book when it first came into the shop (about a month or so ago) and I've picked it up and read it again several times since. It delights me each time. One of the things that delights me, and which intrigued me when I first looked at the cover, is that the art is not what I usually expect from this illustrator. Donovan Bixley is a well-known New Zealand illustrator and author, and his work is usually bold and bright. I like bold and bright - don't get me wrong - and I really like the c I read this book when it first came into the shop (about a month or so ago) and I've picked it up and read it again several times since. It delights me each time. One of the things that delights me, and which intrigued me when I first looked at the cover, is that the art is not what I usually expect from this illustrator. Donovan Bixley is a well-known New Zealand illustrator and author, and his work is usually bold and bright. I like bold and bright - don't get me wrong - and I really like the cheeriness of his Kiwi versions of Old MacDonald's Farm and Little Bo Peep and More...: Favourite Nursery Rhymes (and more), but if I had to choose between a wall of bold and brightly illustrated books and muted tones illustrated books, I'd choose the latter. A visual transformation that improves with each page turn, much like the content it discusses literally and metaphorically. This is a poetical story, in concept, language, and illustration. It is about a little scribble that transforms itself into something vastly different. The doodle's journey was a pleasure to imbibe. In short, I love this story and recommend it to readers and gift givers alike. Just a scribble on the page, Fuzzy eats his way through ink and words and grows and grows until he is transformed into something wonderful! A delightful book by New Zealand author Melinda Szymanik with amazing illustrations by Donovan Bixley. Highly recommend. "Fuzzy started as a scribble..."
Clever and creative with original design concepts. It a lovely book. I loved it! A book for word and book lovers! Clever and creative. This one was so much fun - reminded me a little of the Hungry Caterpillar but even cuter, and the illustrations are lovely. Innovative, creative, unique. Words and illustrations combine to create a story that is so right on every level. Wonderful illustrations and quite a nice idea, but I did not like the rhyming pattern at all. I was first captivated by the cover of this book—the blending watercolour, the shiny, tactile branch made from various cursive words, the sketched fuzzy thing that looks right at you with a smile. I was curious. What exactly is a Fuzzy Doodle? The kids had a few guesses… A fuzzy alien? A hairy caterpillar? The Wonderful Fluffy Squishy Itty Bitty’s best friend? Fuzzy Doodle "started as a scribble, just a scrawly little doodle, a smudge sort of ‘something’ at the bottom of the page.” This scribble I was first captivated by the cover of this book—the blending watercolour, the shiny, tactile branch made from various cursive words, the sketched fuzzy thing that looks right at you with a smile. I was curious. What exactly is a Fuzzy Doodle? The kids had a few guesses… A fuzzy alien? A hairy caterpillar? The Wonderful Fluffy Squishy Itty Bitty’s best friend? Fuzzy Doodle "started as a scribble, just a scrawly little doodle, a smudge sort of ‘something’ at the bottom of the page.” This scribble comes to life. He eats splotches of ink, nibbles on words, chomps on paragraphs, devours all the colours of the rainbow. Fuzzy grows, until one day he curls himself inside a chrysalis. I’m pretty sure you can guess what happens next. The text will delight the listener and reader, with the illustrations taking the words to a higher level of understanding. From simple pen doodling to Japanese-type simplicity of colour use, Donovan Bixley has excelled himself. Fuzzy Doodle could be used by parents and teachers to expand a child's imaginative use of both words and colour. The age recommendation (a read-aloud book for children from 3-7) is only a guide. This book could be used throughout primary school. What a fabulous book! The illustrations are magical, with large swathes of inkness that are just so pleasant to touch. And the writing is lyrical and lovely. Altogether a magical and fantastic story that is suitable for all ages. It's a book eating caterpillar, it's a butterfly-book, it's absolutely adorable. really wonderful picture book from New Zealand.